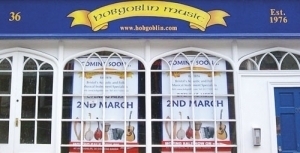 Hobgoblin Music in Bristol is moving to larger premises up the road on 2nd March 2010. The extra space in the new shop will mean that we can stock an even bigger range of musical instruments and accessories, and a much wider selection of music tune and tutor books. The new address (as of 2nd March 2010) is 36 Park Street, Bristol, BS1 5JG. The phone number will remain 0117 929 0902. The shop will continue trading as usual at 30 College Green until the 27th February.